Last year I wrote about why Wikipedia needs more and better content on disability topics, and how anyone can help; and how that fights disablism, by shifting language, removing cliches, decreasing melodrama, respecting personhood, perhaps in small ways, but for a big diverse audience that will never see your blog or your journal article. I'm still pretty involved there, and in the past year I've found more ways to discover stories to improve Wikipedia's disability content; so I'm still preaching that same sermon today. That headline didn't actually have anything to do with disability or discrimination, but I was still startled to see the word "Ableism" appear in a newspaper from over a century ago! I found this because I acquired a Newspapers.com subscription through The Wikipedia Library, a project that matches experienced Wikipedia editors with scholarly resources that aren't always available for off-campus folks. So far it's been extremely useful, and hardly a day passes without finding something fascinating. Like the tidbit above. 1. Eliza Suggs (1876-1908): "Carried in arms or wheeled about in a carriage, her frail hands and well developed head have accomplished wonders, obtaining a fair education, which makes her a valuable assistant, sometimes as secretary of religious organizations and work. In former years she assisted her father, more or less, in evangelistic work, and she has presided in public meetings with marked dignity and ability." 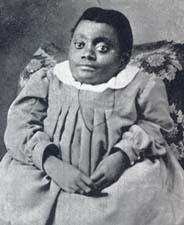 Suggs was born in Illinois, to parents who met while they were enslaved on a Mississippi plantation; she had osteogenesis imperfecta (OI), and was a temperance activist alongside her preacher father, and later on her own. I didn't write this entry but I'm glad somebody did. Here's her memoir online, along with a photo of Miss Suggs (above, right). 2. Anita Lee Blair (1916-2010) was the first blind woman to serve in any US state legislature. I wrote about her on DSTU a few years ago, and finally got her Wikipedia entry started earlier this year. I found a campaign ad of hers from 1952 in a Texas newspaper recently, too, featuring her guide dog Fawn, and text proclaiming her achievements and her independence. 4. Dwight D. Guilfoil Jr. (1926-1989) was a businessman and a disabled veteran, who advocated for hiring disabled workers, and used his own company to demonstrate the possibilities. Guilfoil doesn't have a Wikipedia entry yet, but I think he'd be a great candidate for one. For now, check out an essay he wrote titled "Let's Stop 'Handicapping' Americans," which appeared in syndication, in newspapers across the US, in 1960. UPDATE (February 2016): Dwight D. Guilfoil Jr. has a wikipedia entry now. 5. Mary Dobkin (1902-1987) was a immigrant child in Baltimore when she lost both feet to frostbite as a little girl. This early experience, and a lifelong love of baseball, made her a tireless advocate for poor kids in her adopted city; she coached kids' teams, integrated during the Jim Crow era, and took particular interest in providing sports opportunities for disabled kids. There was a television movie made about her in 1979, but until today, no Wikipedia entry. So I'll get right on that. By the end of today, California time, there will be a new Wikipedia entry on Mary Dobkin, in honor of BADD 2015. (I'll light up her name as a link when the entry is up.) Anyone want to join in? Plenty of other stories to tell, and every well-told story helps.